﻿ Best Price on Maria's House in San Jose + Reviews! 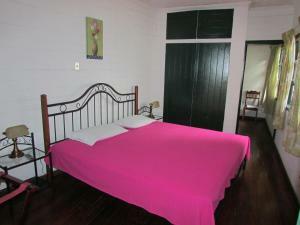 Maria's House is a quaint guest house located a 15-minute drive from the city center in San José. It is just 820 feet from the Perimercado market and offers free Wi-Fi and on-site parking. Each room here has functional décor and comes equipped with a cable TV and a private bathroom with a shower and toilet. At Maria's House you will find a garden, a terrace and a shared kitchen, while restaurants can be found within a 15-minute walk. Juan Santamaria International Airport in neighboring Alajuela can be reached in a 30-minute drive. Payment before arrival via PayPal is required. The property will contact you after you book to provide instructions and due dates to made payments.